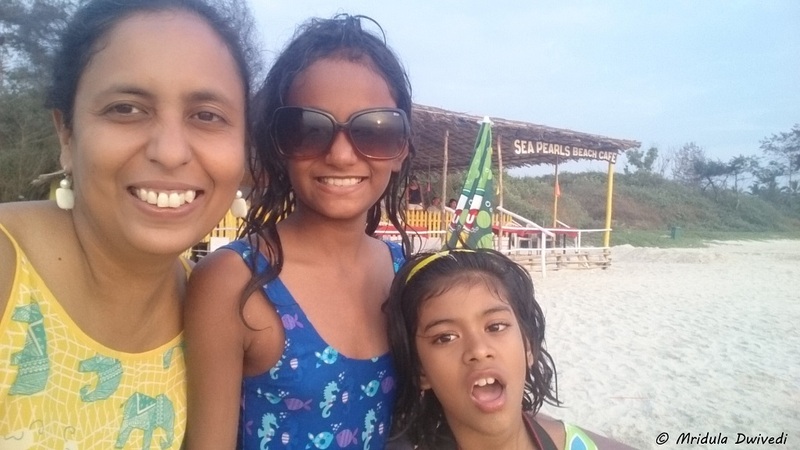 Holiday in South Goa with Kids was a fabulous experience! If you read this blog you know my kids are known as double trouble! Chhavi is my daughter and Vasu is my niece. Together they become double trouble. They have been to Hong Kong before Goa. 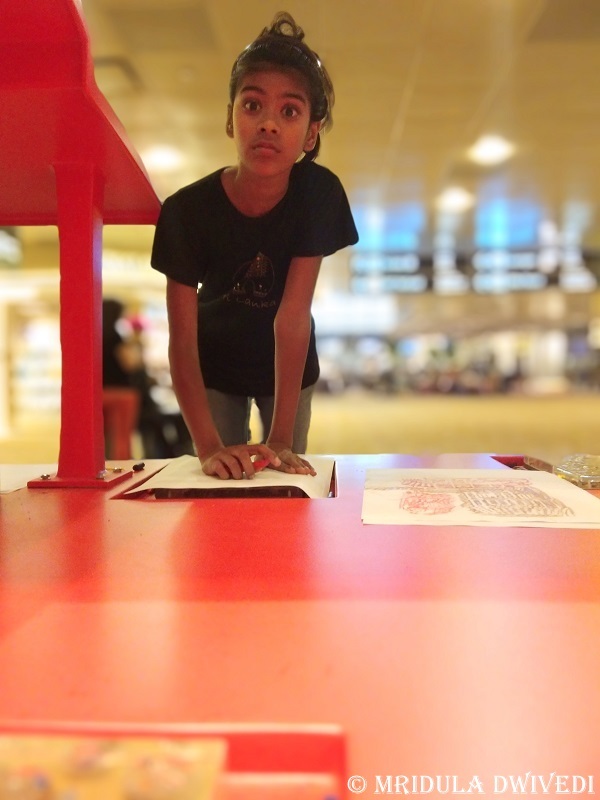 While I was alone with them in Hong Kong, I had a lot of help in Goa. 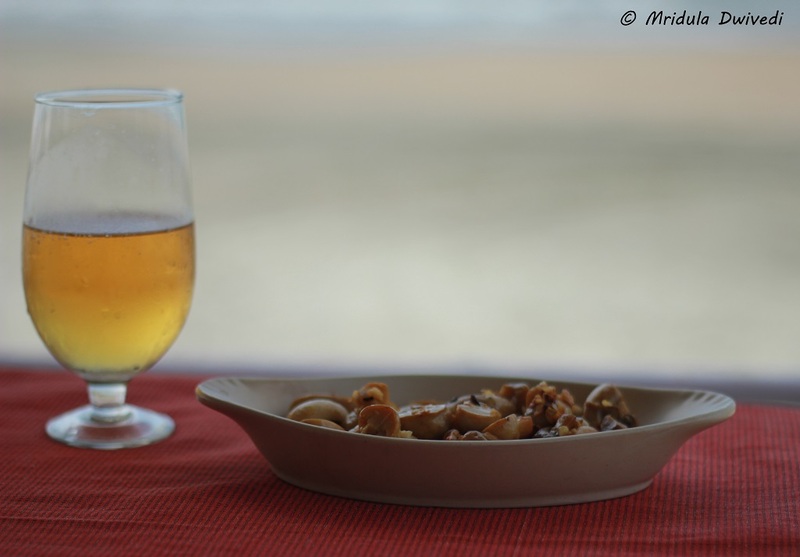 We were staying in a serviced apartment in South Goa, quite close to Ramada Caravela Beach Resort. Fatrade Beach was at a walking distance. If you wish you can also rent villas from companies like Choose Villa. Luckily both my girls love water, so keeping them entertained was not a problem at all. However, from my experience I know that keeping their stomachs full is critical to the success of a holiday! We managed to do that as well. All of us arrived at different dates. Seshadri and Chhavi arrived first. Next day Seshadri’s parents arrived. Vasu and I arrived a day after that. And the last to arrive was Seshadri’s college friend. 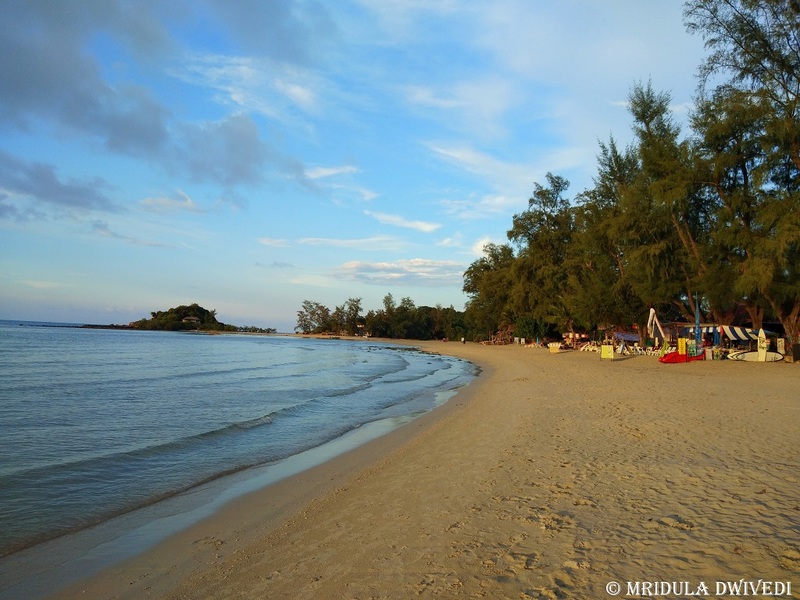 On the first evening when Vasu and I arrived, all of us went to the Fatrade Beach. The girls got drenched within no time. I joined them merrily. 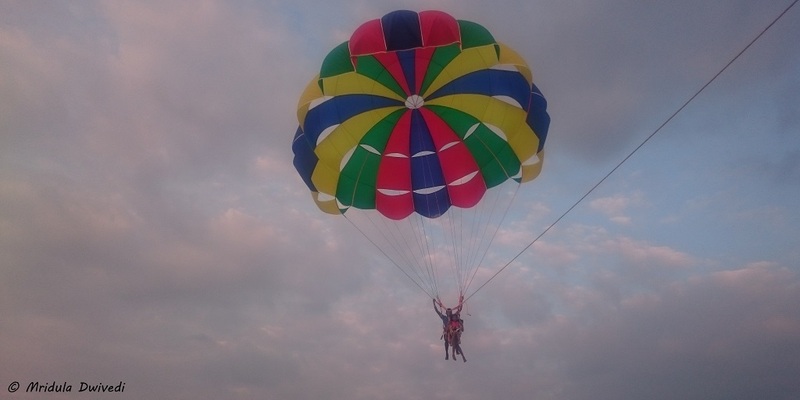 An Awesome Holiday in Goa! There is a beautiful side effect of playing in the water and being outdoors for hours on end! As soon as the dinner got over, the girls crashed to bed without any fuss! It was my task to tell them a bed time story! I would tell them a silly one, basically narrating the days events, only changing the names of the two little girls! They would giggle like crazy and go to bed soon! They knew it was their story and they would keep giving me suggestions along the way! I Clicked it with a Zoom Lens, they Never Stand this Still when I am Around! On day two, our agenda was the beach again! The kids got up quite early and they left for the beach with Seshdari and his friend. My in-laws were going for a city tour. So we left together, I for the beach and they for the city. By now we had found a good shack to sit by while we took turns to keep an eye on the kids. They played like small cute wild animals till they could play no more! They went about 9.00 am and came about 1.00 pm. She Wanted my Sunglasses too! Then it was time for lunch. The girls are experts at ordering and then not eating stuff. By the time we went back to the flat everyone wanted a siesta other than the two kids! My in-laws were back too and sleep was high on their agenda. So, I offered to stay up with the girls and take them to the beach in the evening again. In the meanwhile the sprinklers went on the lawns of the apartment complex and out ran the two, to get wet again! That evening no one else was in a hurry to go back to the beach except the kids! 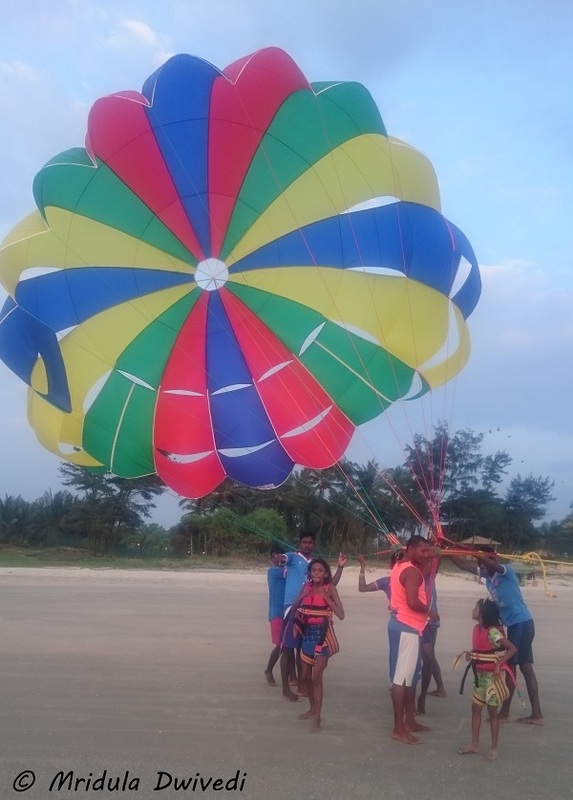 Once there, the girls decided that they wanted to do parasailing and I reluctantly agreed! But they were so tired by the evening that they didn’t protest much when I suggested we go home! Dinner was cooked by my mom-in-law. After an early dinner once again the girls were quite happy to go call it a day! 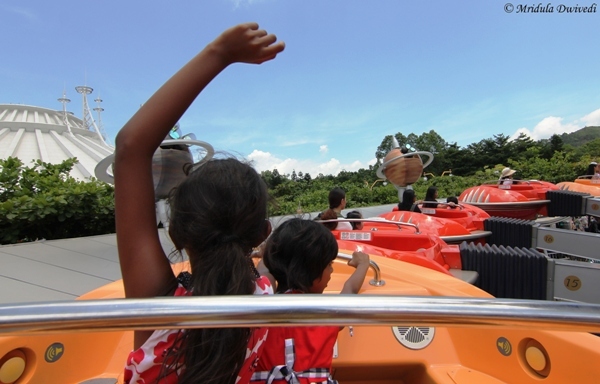 Holiday in South Goa with Kids! On our last full day in Goa my in-laws, husband and his friend went to the Cavelossim area. We girls hit the beach once again! By now our shack routine was perfect. 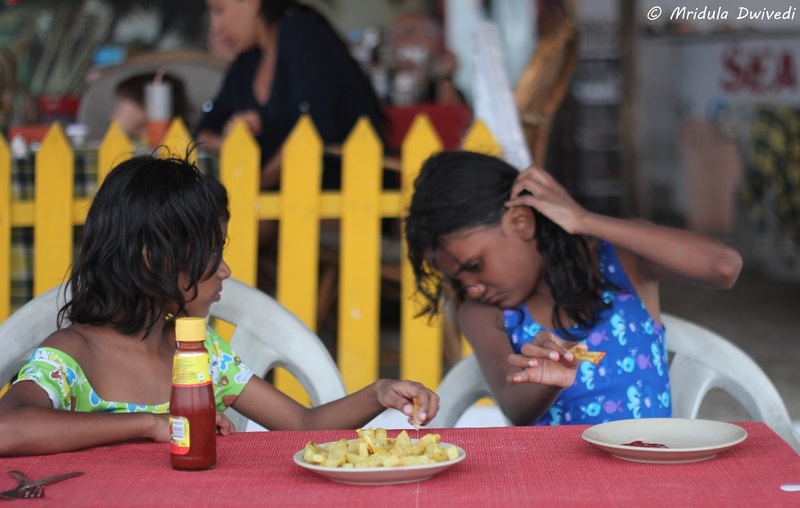 The girls were known there, they knew me as their mom and we all knew what we liked to eat! As the day would go by, the girls would ask for French Fries and Chocolate Milk Shake. Sometimes they would ask for coconut water too! Towards the afternoon I would have a beer with fried mushrooms. We would take turns to get wet! By afternoon we would go back in search of lunch! On our last evening Vasu, Chhavi, Seshadri and I went to the Cavelossim Beach. The sunset that evening was amazing. 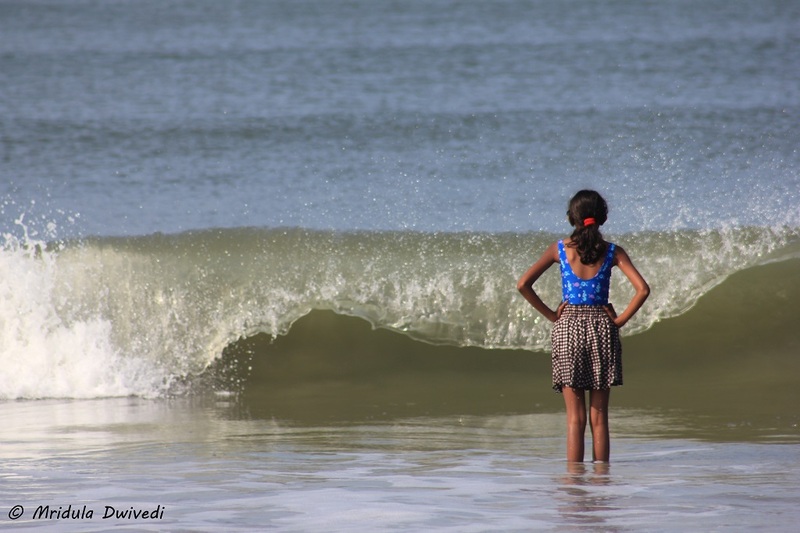 The first picture in this post has been clicked at Cavelossim Beach in South Goa. 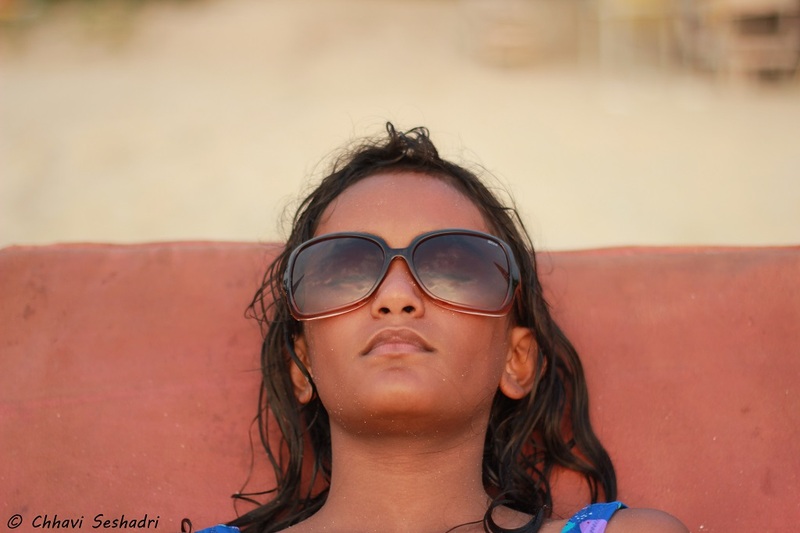 Even though we did nothing much other than hitting the Fatrade Beach in South Goa, it was an awesome holiday for all of us. 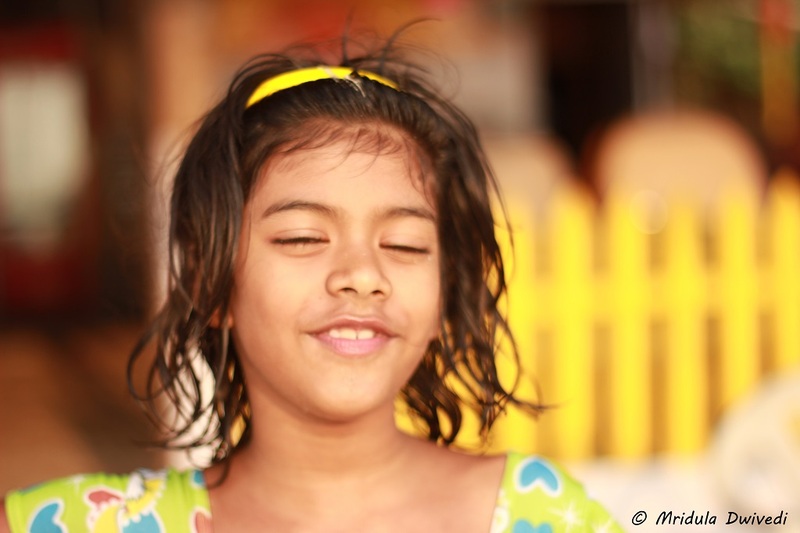 The girls already can’t wait to go back to Goa! 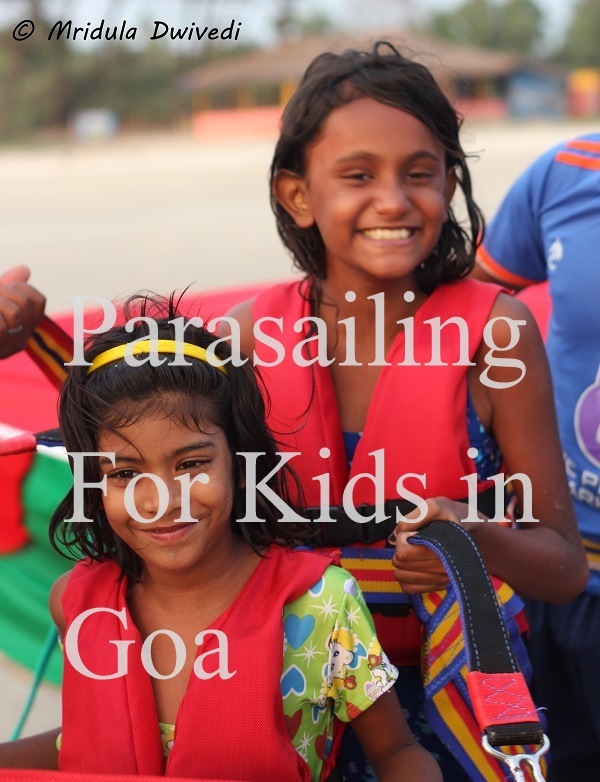 When we went on a family vacation, parasailing for kids in Goa was never on the agenda. But they managed to put it there soon and were done with it too! 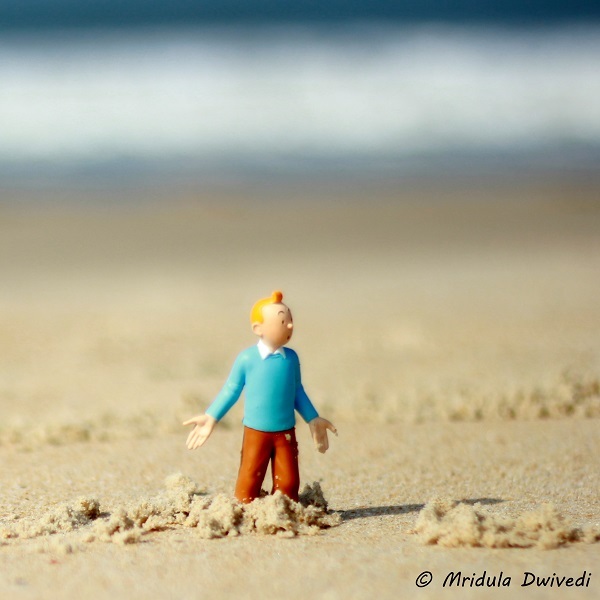 We finally managed to take a family vacation to South Goa this November. We all travel a lot, my husband does, so do I! 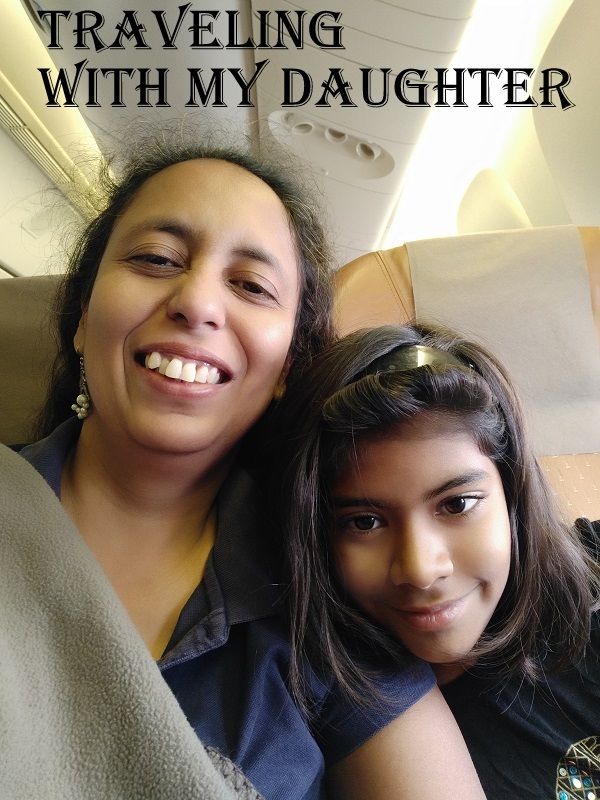 Chhavi travels with both of us! But we three rarely get a chance to go together! But this time we were a big group. 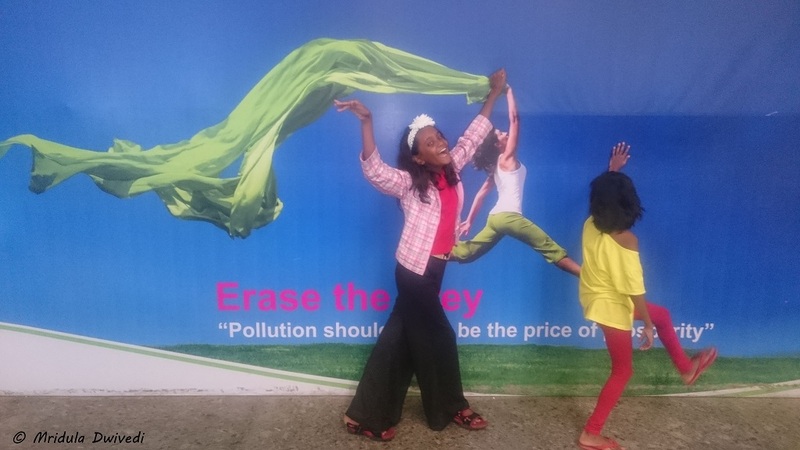 Seshadri and I were there, so were double trouble– Chhavi and my niece Vasu. Seshadri’s parents were there. And one of Seshadri’s college friend joined us too. So in all we were 7 people staying in a serviced apartment in Goa. Still one evening it was only the kids and me chilling at the Fatrade Beach. Everyone else was tired and taking their siesta. Double trouble asked me if they could go parasailing. I told them to go and inquire about it. If the experts allowed them I would think about it. The place was about 50 meters from the shack which we used to frequent. I thought the girls will not go on their own to ask! But off they went without giving me a backward glance! 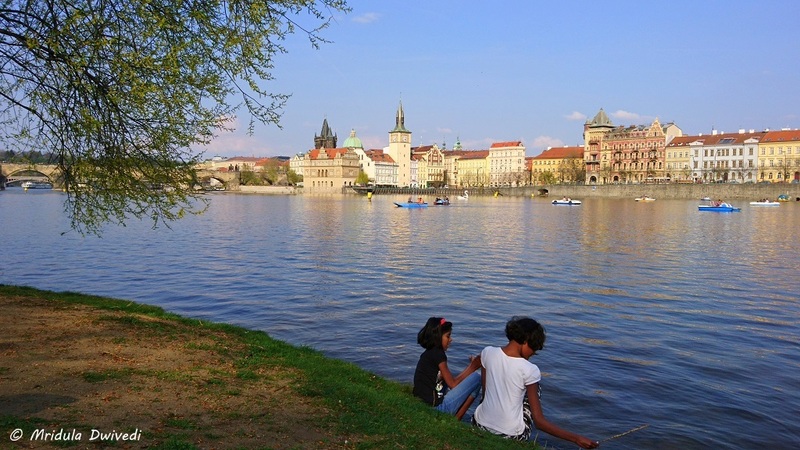 They came running back to say they would be allowed and it 2400 rupees for two people. 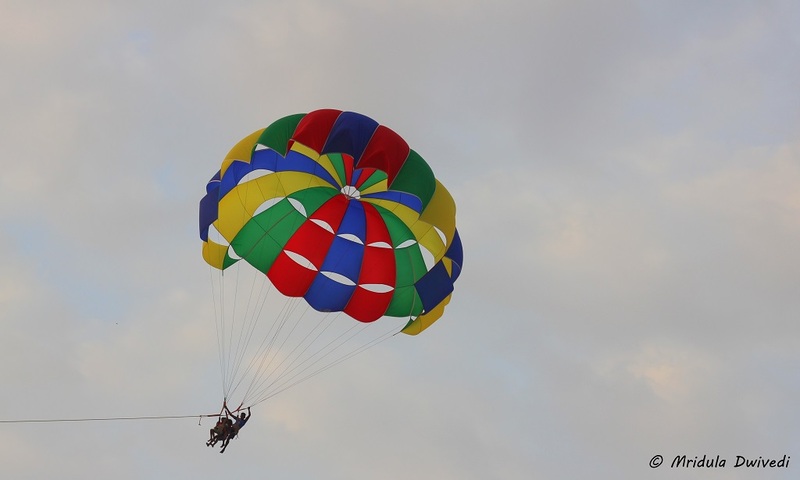 However, at that moment due to lack of customers, the parasailing was halted temporarily. I knew that. But they thought it had stop for the day. I didn’t correct them. I got up thinking I will talk to the guys and see if they were really allowed. I was still finding it hard to believe that they would take two small children up in the sky! But they told me as well, that it was not a problem at all. 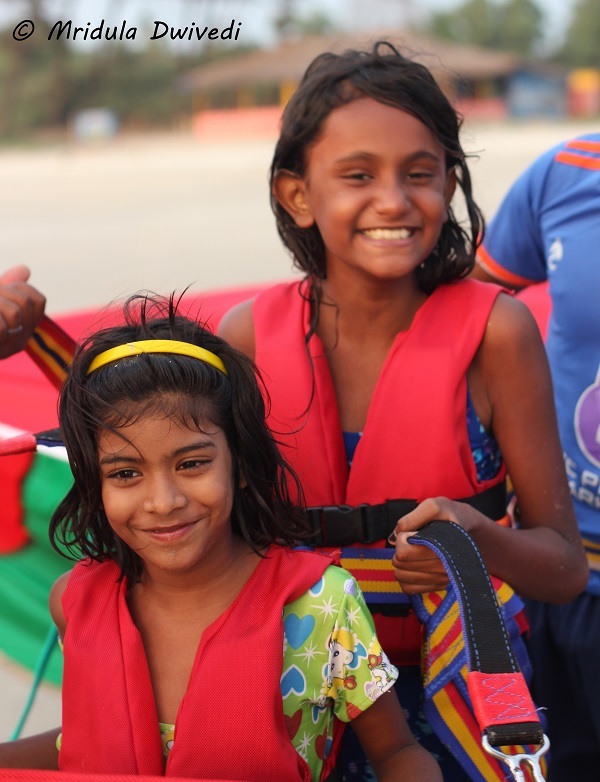 Out came two small life jackets for kids. The girls are eight and ten. There was no other adult from my family on the beach. The decision to let them go was entirely mine. Truth be told I was scared but I did not want to hold them back! Tintin was equally surprised at what I was doing! But my heart was almost in my mouth. I, for a second, thought of the consequences of something going wrong but then I had seen the sail go up so many times the same day. There was an instructor with them. He went on all the sails. It Felt Like an Eternity to Me! And within no time they were soaring up in the sky. They must have remained up in the air for just a little more than a minute. And yet it felt like an eternity. Here is a short video of their adventure. I stopped mid-way because the guys handling the activity wanted me out of the way of the ropes. As they came back to terra firma, I exhaled a huge sigh of relief. They were on safe grounds again! They were busy, chattering with each-other. And of course, they wanted to do it again!